I have uploaded the rest of the pictures of Turkey to Shutterfly, about 250 pictures. 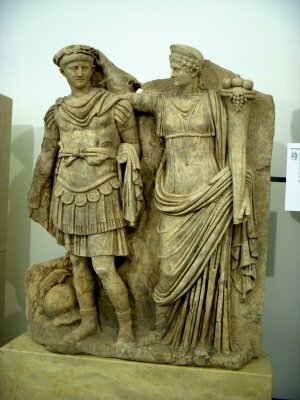 I arrived in Athens via Thessalonica. I took the thirteen-hour sleeper train from Istanbul to Thessalonica. The cabins are cramped, but comfortable, and it was the first sleeper train I have experienced. I shared the double cabin with a guy from China that is on business. I also met a wonderful girl from Lithuania that loves Greece, and she hitchhikes around the country, she is very cute, warm, and comical. The train ride is considerably bumpier in Turkey; the rail in Greece is smoother. I couch-surfed in Thessalonica, and slept some long hours. 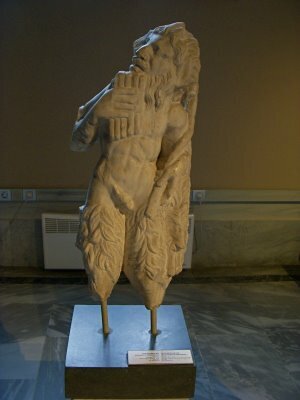 A sculpture of Pan, notice the pan flute. My first impression of Greece is very positive, people smile, and in Thessalonica and Athens, there are many women on the streets—babe heaven, compared to the Islamic world with the majority of men on the streets. The freedom of thought and choice in life is considerable, and noticeable, here in Greece than the Islamic countries I have traveled. The difference of the disposition and the demeanor here in Greece from Turkey is grand. The Islamic culture is restrictive to the point of causing frustration and a peculiar behavioral pattern among the populace. The Greek sense of humor is excellent, everyone laughs at the littlest occurrence. I found the Turkish to take life too seriously. Athens has a great subway system, although it was slightly difficult to find the hostel, even so, I got to know the subway system and the way to the airport. The hostel is only 14 Euro a night. With a good exchange rate for the Euro, Greece is not that expensive, currently I buy 80 euros for $100. All the archeological sites here in Athens are free on Sundays in the winter. 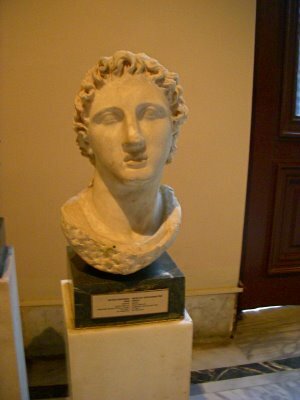 The head of Alexander the Great. Great news, the Russian visa is now ninety days, pre arranged, though. In addition, the Ukrainian visa is ninety days on arrival, too. All the Eastern European countries that I have looked up allow a ninety-day visit, no visa necessary upon arrival for citizens of the USA. While in Istanbul, I met many Americans, the most Americans in any one place since my travels begun. One woman from Austin Texas, in particular, I met at the hostel. We acquainted ourselves; we visited regularly, had dinner one night, and enjoyed some beers on the rooftop of the hostel. She is twenty-three and traveling about two or three months, we shared each other’s stories and experiences. She is a woman who has a listening ear to the deeper context of life. Including in our conversation, we conversed about how the ego relates to traveling and the prevalence of the ego among the tourists. The same questions arise from travelers—where have you been, how long are you traveling? The issues of how much are you carrying are a subject. When people observe what I am carrying, and compare the length of time I am traveling, they are perplexed. Emily was explaining that another subject is if the traveler is camping is an issue among travelers. I have a couple of rules to combat an ego-driven mentality that continually strives at controlling the attitude. First, I will only talk about my travels if I am asked, though, I will only answer the question that is asked. My story is lengthening that will require consolidation of the details. I could just hand out my card and tell the person to look up my travels on the Internet, although many people do want me to express my experiences, and for some people it is healthy for them to hear my story because of their ego involvement. However, because of the length of time in each country and the long-term travel of five to seven years—that context can boggle the mind/ego of the short-term traveler, although the majority is respectful. The tone of expression is different because of the length of time completed, compared to the beginning of my departure a year ago. The same questions will arise because of my style of travel. How did this come about, why are you traveling, how are you financing your travels, are you working while you’re traveling? I have gotten good at explaining the story, although this is one reason why I would rather avoid touristy areas. A combination of the ego playing upon others, and the emotional baggage of other travelers is draining. Being away from tourists for the first month in Turkey and then being around many tourists from a distance starting in Cappadocia—I observed the emotional shambles that some experience—their words express disappointment—their disappointment revolves around getting enmeshed into the trap of tourism, or moving to fast. Continually, I observe tourists that lack navigation skills, then they rely on a tour agency to figure it out, or the hotel, I avoid both. Navigation is the number one difficulty that many travelers struggle with, I have been around many people that don’t know where to go and they mind is running a mile a minute, and their mind is a mile ahead. Personally, I don’t think—I feel, I will feel the energy of where I should go, or discern the movement of the energy that is pointing to the location of my destination. Nevertheless, I can understand why many people purchase tours, because of the trouble-shooting that is involved with navigation. The subject of becoming “lost” is overrated. Fear is at the forefront of the mind that the person may get “lost”. The underlying context does not make sense—you’re still on the earth, there is blue sky above and most likely your standing on a road. OK, you’re not “lost”. If you’re in a city, jump in a taxi, ask someone regarding the neighborhood of desire. I will be flying to Israel tomorrow. Next post: Quick Update—Tel Aviv. Previous post: The Complete Tour of Turkey.